The satellite is French-built, sits in a Monaco-designated slot, and was carried up on a US-designed rocket. 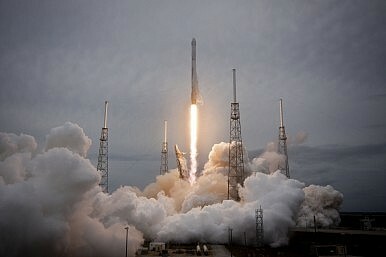 Monday evening, after one last delay — 49 minutes for clouds to clear — a Space-X Falcon-9 rocket lifted a satellite into orbit from Cape Canaveral, Florida. Via teleconference, Turkmenistan’s President Gurbanguly Berdimuhammadov watched his country’s first communications satellite soar into space. The moment was years in the making. The satellite, which bears the cumbersome name TurkmenAlem52E/MonacoSat, is one of only a handful of satellites orbiting the earth bearing a Central Asian flag. Kazakhstan operates two communications satellites — KazSat-2 and KazSat-3. Built by the French-Italian Thales Alenia Space company, Turkmenistan’s satellite was initially supposed to lift into orbit from China on the back of a Long March rocket. The International Trade in Arms Regulations (ITAR) and the U.S. Munitions List (USML), which control the import and (more importantly in this case) the export of defense-related materials was reformed in late 2012, but still made it impossible for Thales to launch using Chinese rockets. The fiscal 2013 defense authorization bill allowed the president more leeway in lifting restrictions on import and export of commercial satellites and components, but still restricted the transfer of technology to several countries — China, Cuba, Iran, North Korea, Sudan, and Syria. We appreciate Thales’ confidence in our ability to safely deliver Turkmenistan’s first satellite to orbit…We are pleased to see the market expand with new entrants, and SpaceX looks forward to leveraging the world’s most reliable and advanced rockets for customers across the globe. In exchange for allowing Turkmenistan to use its slot, Monaco was able to secure a favorable price for purchasing 12 of the 38 transponders. SSI Monaco, the company set up to commercialize the orbital position, has struck a deal with satellite fleet operator SES of Luxembourg to commercialize Monaco’s capacity. The launch was perhaps ill-timed, as Turkmenistan recently began cracking down (again) on satellite dishes in the country. Widely acknowledged as the most restrictive and closed country in the region, Turkmenistan tightly controls the transfer of information to its people. When TurkmenTelecom, the state communications provider, unveiled its first high speed internet offering in 2011, the price was absurdly high and the service reportedly doesn’t include any international news channels. Monaco SSI has a recording of the SpaceX launch on its website.